Ever Dream of South Africa? Win a Braai Trip! Recently, Excelsior Wine in South Africa asked if we could spread the word about their latest contest, where our readers and followers can win a dream trip to South Africa. Let me tell you how. But first, this was an interesting time for Excelsior Wine to come to us asking about promoting a contest for a wine and BBQ trip to South Africa. As we are in the final weeks of our #USChowDown, we are already planning for our 2017 travels. Although we have spent a lot of time this year returning to places we love, we are hoping to get to a few new destinations, and in particular new countries, in 2017. We placed South Africa on the top of that list. Why? Wine. Pure and simple, we want to explore the wine tourism offerings in South Africa. And, what goes well with wine? During our current #USChowDown, we’ve been exploring Southern BBQ. From The Shed BBQ in Ocean Springs, Mississippi, to a weekend of BBQ love in Memphis, we’ve been enjoying loads of different types of tasty BBQ. 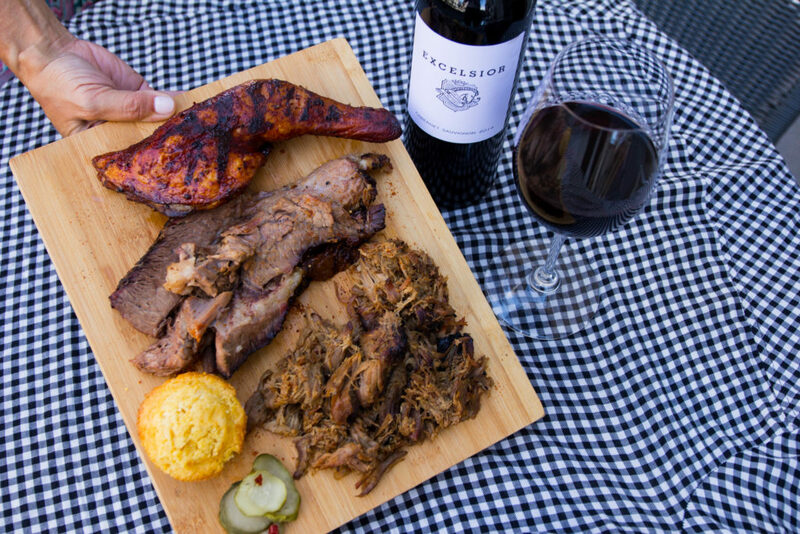 And, although many people think that BBQ goes perfect with beer, we’ve been experimenting with BBQ and wine. During the #USChowDown, we were pairing refreshing sparkling red Lambrusco with home made BBQ, seasoned with Mama Honey’s Hiney Rub in Macon, Georgia. We’ve been eating and drinking well, so I am sold on the concept of BBQ and wine. When I heard about the concept of drinking South African wine, while enjoying South Africa’s version of BBQ, though, I was intrigued. I was more than intrigued! I was sold! Being American, I sometimes think that America is the end all and be all of BBQ, but I know in my heart of hearts that there are all different ways to make BBQ, or to grill well. Braii, pronounced “Br-eye”, is South Africa’s version of grilling. Yes, the meat and the flavor are important, but the importance of Braii really comes from a way of life, a way for friends and family to gather together, and to cook, and drink wine together. Because nothing partners better with grilling good meat than good wine. Excelsior is one of South Africa’s top wine estates. It is located only 90 minutes from Cape Town, and is run by fourth and fifth generation wine owners. 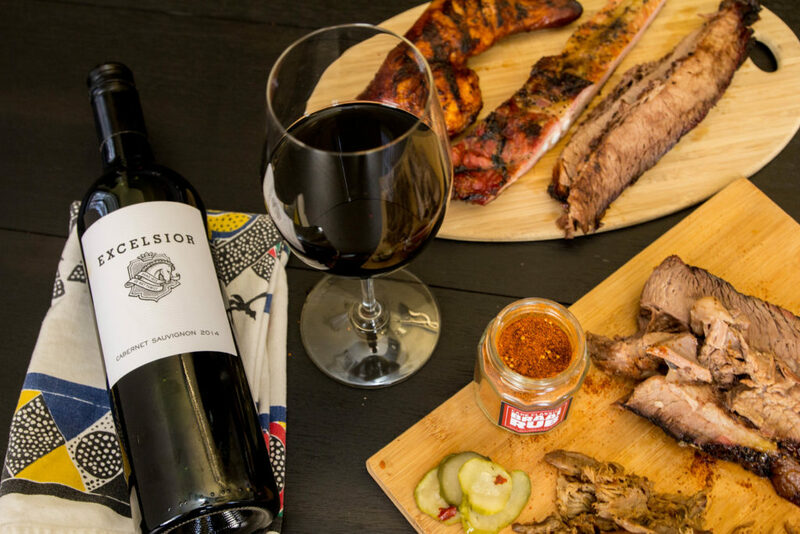 At the Excelsior Wine Estate they often pair their wines with South African Braai. The Excelsior Wine Contest is called BBQ to Braai. Their goal is to find America’s First Braai Master. In a partnership with Cape Classics, Excelsior Wine’s importer into the US, and South African Airways, they are offering one lucky American grill master a trip for two people to Cape Town to learn how to make South African braai, on the wine estate! Excelsior Wine Estate is located in the picturesque Robertson Valley, in the shadow of the Langeberg Mountains, approximately 100 miles east of Cape Town, with a focus on Cabernet Sauvignon, Chardonnay, Sauvignon Blanc and Shiraz. Many of these wines pair perfectly with grilled meats. The Grand Prize winner of the BBQ to Braai contest will win two coach round-trip tickets to Cape Town on South Africa Airways, along with five days, and four nights in South Africa. The trip will include 2 nights in Cape Town, and 2 nights at Excelsior Wine Estate. While staying at the Excelsior Wine Estate, the winner will learn braai skills from a braai master, Peter de Wet, of Excelsior Wine! Applicants must be residents of the US, and able to jet off to South Africa from either JFK or Dulles Airports between February 1 and May 1, 2017. How to Enter to Win a Trip to South Africa! To enter, visit Excelsior’s contest website to submit an original, 60-second (or less) video. The video must tell Excelsior why the applicant should be named America’s First Braai Master. Entries will be accepted through October 2, 2016. Once all entries are in, a two-week voting period will follow. Ten finalists will be determined by a popular vote. A team of judges will evaluate the finalists’ videos for creativity, visual appeal, clarity of message, and inclusion of South Africa, Braai, or Excelsior in the message.